As usual, my vacation plans were a tad overambitious. Realizing that two weeks spent in Canada and Maine would be heavy on activities not able to be enjoyed by everyone in the family and rustic locales that would have caused marital stress, I decided to finally see what all the fuss was about and booked a cruise instead. It had always seemed like a perfectly awful way to spend a week, but could 15 million passengers a year (including my sister, my in-laws, etc) who go on them all be wrong? Curiosity, and a sudden scramble to find alternate plans, got the better of me. So, if you’re one of the 96.74% of Americans who haven’t been on a cruise (or higher proportion of any other nationality), here’s my personal take on the experience. Cruising is easy. In our case, very easy – a half hour drive to Bayonne, NJ, where we were efficiently processed, had our bags whisked away and were on board our ship, the Celebrity Summit, 45 minutes later. Once on deck, the ship is your hotel so there’s no need to pack and unpack. Also, there’s no need to worry about baggage fees, etc, though the staterooms are pretty tight on space. Finally, your kids can’t stray too far. Being at sea is cool. We spent three days on the open ocean and not being able to see land in any direction is a unique feeling. You can spot plenty of other ships in the distance and it’s fun trying to make out what they are. Strolling on the deck in the moonlight beats any after dinner walk I’ve been on. Having said that, they don’t call it seasickness for nothing. I only got queasy once, but two of my kids were worse off. My wife, who wore one of those ear patches, was hit worst of all, but, strangely, a day after we got back home. The service was excellent. Now Celebrity is a higher-end cruise line so experiences may vary, but the ratio of passengers to staff was two-to-one. They are mainly from the developing world or eastern Europe and seem to be highly-motivated, if probably woefully-paid by American standards. You are trapped. Yes, the ships are big, but you’re basically stuck with the same group of people in a large, somewhat cramped hotel. The cruise lines know this and constantly try to sell you stuff or otherwise take money out of your pocket. This is why they never sail empty – better to give away a cheap fare at the last minute and make it back on $3.50 soft drinks and losses at the casino. It’s crowded. Imagine 2,000 people trying to share a few hundred deck chairs, a handful of hot tubs and two small swimming pools. Now picture all this with blaring music, plates and bottles left lying around willy-nilly and the pool pitching back and forth. Despite the cruise lines’ best efforts, you can only fit so many people on so much deck space without unwanted togetherness. Fortunately, if you veer off the beaten track, parts of the ship are practically deserted. (For example, the library – not a very literary crowd these cruisers!). Sheer, unbridled gluttony. It’s not so much that many of our fellow passengers were generously proportioned but how they spent the cruise – stuffing their faces. Food is available 24 hours a day and is free except for certain specialty restaurants. Being free, there is an appalling amount of waste – half-eaten servings left on the table to leave room for dessert. Personally, I still feel guilty if I don’t clear my plate or if we order too much in a restaurant. I can only imagine what the serving staff from India or Haiti thought of the waste and the thousands of unnecessary calories. Ka-ching. 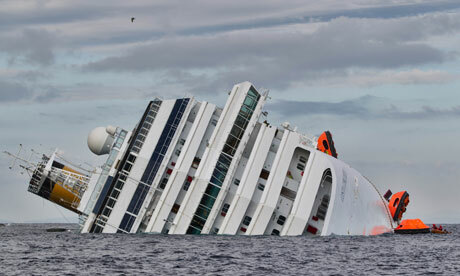 The cruise lines’ ability to milk the maximum return out of passengers is a wonder to behold. Passengers too lazy or intimidated to walk 200 feet from the boat and hop in a local taxi or ferry paid twice as much or more for “excursions” that took them to the same places. People paid hundreds of dollars for beverage packages and then bragged how clever they were by staying drunk all day. Maybe they did well compared to paying the inflated prices on board, but I bet few if any consumed enough that the ship didn’t clear a profit. This ain’t the Titanic. I don’t mean the hitting an iceberg and sinking part – I mean the glamour aspect. This cruise line sold itself as fairly sheeshy and required formal dress for some dinners, but we weren’t exactly rubbing elbows with Rockefellers. Retired dentists were about as rarefied as the passengers got. And the food was fine but more “goor-may” than gourmet. What else could it be given the logistics of feeding so many people and the fact that every fish or steak has to be frozen? I winced every time people picked up days-old sushi. Yuck. We had fun, enjoyed some nice family time and had a blast on the beaches in Bermuda. But we won’t go on a cruise again for a long time, if ever. I can see the appeal for adults traveling alone, for large groups or for couples looking for a trip that keeps their young children occupied while the adults go do what adults do. For us, a week at the beach would have been more relaxing and cheaper while an airplane journey to a foreign locale would have been more interesting. You may go somewhere on a cruise, but it’s not really traveling. This entry was posted in Uncategorized and tagged bermuda, celebrity, cruise, cruising, gluttony, travel, vacation. Bookmark the permalink.